GRI Recruitment 2018 2019 Application Form for Guest/Part-Time Teachers Jobs Notification 2018 Released. 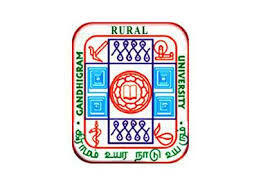 GRI invites Walk in Interview for appointment in following Part-Time Teachers post in Gandhigram Rural Institute. Candidates are requested to Download Application through Official website Part-Time Teachers1. Prospective candidates will have to before Walk in Interview carefully reading the advertisement regarding the process of examinations and interview, eligibility criteria, Offline registration processes, payment of prescribed application fee/intimation charges, GRI pattern of examination, GRI Syllabus, GRI Question Paper, GRI Walk in Date, GRI Result Date etc. 2. Centre for Studies in Sociology - M.A. in Sociology / Rural Sociology / Rural Sociology and Panchayati Raj with a minimum of 55% of marks. 5. Dept. of Rural Industries & Management - M.Tech. in Textile Technology with First Class, Minimum 5 years of Teaching and Industrial experience. 6. Dept. of Economics - M.A. Economics / M.A. Econometrics / M.Sc. Mathematical Economics with M.Phil. / Ph.D. / NET/SLET in any branch of Economics.